When you’re searching for Mobile Chip Repair for your windshield near Phoenix, Mesa, Chandler, Scottsdale, Glendale, Gilbert, Tempe, or anywhere else in the valley T&S Auto Glass is here to help! Our team of mobile chip repair technicians can meet your at your home or office to help you take care of your windshield chip. Avoid Getting A Ticket – Learn about the law and windshields here – How Long Can I Drive with a Windshield Crack In Arizona? We save you time with chip repair in Phoenix by coming to you at your home, work, or whatever location you need. Let’s save you time by replacing your windshield while you take care of your business. Out mobile chip repair technicians are professional and punctual to help keep you on schedule. We communicate with you clearly about when and where services will be provided to make it easy. Your satisfaction is priority #1 and all of our mobile chip repairs are done with the latest techniques and our mobile service is every bit as durable as services rendered at our shop in Chandler, AZ. We provide mobile chip repair all over the Phoenix Valley and at our shop in Chandler. It’s easy to find out shop if you preferring stopping by and just having your windshield chip repaired. It’s quick and easy to schedule your appointment by phone or you can get in touch via our contact form. We can schedule same day service most of the time to help you get repairs quickly. Whether you get chip repair at our shop or mobile chip repair we get the job done right and quickly. Repairs usually take less than 30 minutes to help keep you on the move with your day. Chip repair techniques and compounds used to fill in the chips have advanced making it possible to permanently repair a chipped windshield. You can have peace of mind that when our team repairs your windshield chip that it will not reappear or spread into a crack! It isn’t just your windshield that can get chipped while driving. The side windows, rear windows, vent glass, side mirrors and rear view mirrors can also get damaged. There are also different types of chips windshields get such as: bullseye chips, star chips, crater chips, horseshoe chips, and the dreaded cracks. We use the best techniques and products to give you the best chip repair service available anywhere. It’s important to take notice of the tiny chips in your windshield and get them fixed promptly. A tiny chip can easily turn into a large crack. This is due to how heat and cooling cause the glass to expand and contract. As this happens each day and night the chip can easily spread and make it necessary to replace the glass. How Long Does Mobile Chip Repair Take? The service is quick and easy lasting under 20 minutes to complete correctly. Take the time today to call and have it repaired before it becomes a bigger problem. How Clear Will The Repair Be? Chips are full of air that causes them to be white and cause blind spots in your vision while driving. Our mobile chip repair service fills in the gaps and improves the clarity of the chip by an astounding 70 to 95%. How Much Will Chip Repair Cost? The cost to repair chips in your windshield or other auto glass may be little to nothing with your auto insurance. If chip repair isn’t covered by your policy we offer inexpensive chip repair so you can save your windshield and drive safely! For the exact cost to fix your windshield chip please give us a call at (602) 667-3030. 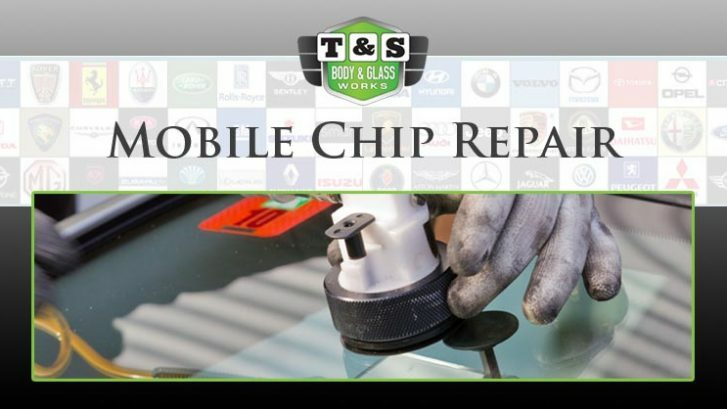 If you live or work in the Phoenix Valley and need mobile chip repair T&S Auto Glass has you covered. We can schedule most repairs for same day service and get our technicians out to help you quickly. Don’t delay your chip repair and risk you windshield needing to be repaired, or having an accident because you can’t see. Call today to experience our prompt, professional, and top notch chip repair services.